All authors, especially those of us of the independent persuasion, understand the importance of reviews and building one’s platform. Readers are less likely to check out an unknown author whose work has zero reviews and ratings. While just getting reviews are great, what if you could you could also be a part of an awesome community of authors, who all work to propel each other forward? It’s hard enough, stumbling through figuring out how to build your platform and promote your work. Rave Reviews Book Club has been nothing but superb. It’s exactly that — a community of authors, all working together. I’ve connected with so many writers on Twitter, and not just as authors, but also making friends. I’m going to just put it out there: I’m looking for a partner in crime. I mean…blogging buddy. Most of my posts here on my personal blog bounce back and forth between writing and mental health. I’m hoping to separate the two — one for writing, one for mental health issues. I’d like to keep my own personal blog for mental health, and team up with one or two other writers to start a blog geared towards writing, grammar, book reviews, etc. If you’re interested in teaming up, please leave me a comment or email me at allisonwilliford@icloud.com. I look forward to hearing from you! I was immediately intrigued by the premise of this book. As a mental health advocate and with first-hand experience as someone living with mental illness, I have a soft spot for memoirs involving psychology. The idea of someone being able to recall one’s own birth and infancy was something new I had not heard of, and it definitely piqued my interest. Overall, I thoroughly enjoyed Von Ghlan’s memoir about Jessica. I found myself empathetic and saddened by her anxiety and unique ways of seeking help — something I can definitely relate to. I also found myself cheering for her throughout her recovery and at each breakthrough. At the beginning of this story(and, in a way, joining Jessica on her journey into her own psyche), I was touched at how much Jessica’s first appointment reminded me of my own first attempt in therapy; I relived that anxious feeling of not knowing how to express myself. There were a few parts, sparsely, that I found myself fighting to not skim through. One particular scene is most prominent in that aspect. It is an early scene that describes Jessica’s morning routine, down to eating breakfast, brushing her hair, moving quietly through the house. I somewhat understood, later on in reading, how this scene shows Jessica’s pre-therapy personality; but at that point in the story, I didn’t really feel like I understood or felt like I knew her well enough at that point to care (for lack of a better word) about being walked through every step she took. I felt like I was being lulled along by her backstory as a teenager until the part in which she went to the movies, came home, and didn’t not speak to anyone for several days. In the end, however, I was glad to have picked up Von Glahn’s memoir. I am all too familiar with being on the other side of the psychology fence as a patient, so I enjoyed reading it from his point of view as the psychologist. His first-person POV felt genuine, and I discovered myself feeling and thinking some of the same things during Jessica’s therapy sessions — wishing I could shout at her, “Why?! What do you mean you don’t want your ‘me’ back!” or wanting to cry for her. All in all, a very good read. I highly recommend Von Glahn’s memoir if you have any interest in psychology, whether as a patient or an expert. You can check out Jeffrey Von Ghlan’s memoir on Amazon and Barnes and Noble! Book trailers seem to be a pretty popular trend. I’m not really sure why. The whole point of a book is to read, not watch. I browsed through a few on Youtube yesterday — most of them for Romance and Young Adult novels — and a good majority of them featured pictures of models or actors. One even had clips from a TV show. How many people actually watch these trailers? I have a beef with this. One of the fun parts of reading a book is getting to imagine what the characters and settings look like. Book trailers that feature pictures and video clips of real people take away from the joy of using your imagination. For my previous Meet the Character posts, I included links instead of embedding the image in the post, offering people the choice to look or not. I had a very clear image in my mind of what my characters looked like before I found actors who best resembled them. I get that some people like knowing exactly what a character looks like beforehand, but not everyone does. Besides, you shouldn’t need to rely on pictures to portray your characters; your description in your novel should be able to do all the work. Don’t include images of someone’s face. Perhaps someone looking away, with their face blurred, or the back of their head — you get the gist. Just not the entire face. Not all readers want to be shown exactly what your character looks like. Brevity is key. Keep it short and sweet. One minute, at the longest, should suffice. There were a few I saw on Youtube that were between 3-4 minutes long. I never made it past the 1:20 mark on any of them. Don’t spill the beans. What I mean: don’t divulge your entire plot. A book trailer should tantalize your readers and make them want to read it, like your back cover blurb. For fun, I put one together for Waiting for You. I used iMovies, but to be honest, I have absolutely no idea what I’m doing when it comes to making videos. 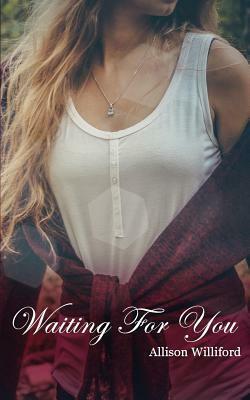 Waiting for You book trailer from Allison Williford on Vimeo. What are your thoughts on book trailers? Any tips for authors who are thinking about making one?